News category: Jobs - published on 12 April 2018. Application deadline: 6 February 2018. Post-­doctoral position at IFAE Gamma Ray Astronomy group in Barcelona Spain. 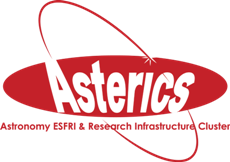 ASTRON has opened a position for a Project liaison officer to work together with the ASTERICS Management and Support Team. Project assistant position is open at ASTRON. PhD position opening with the neutrino astroparticle group including IceCube at Stockholm University. Computer Engineer position is open at LAPP, Annecy-le-Vieux, France.